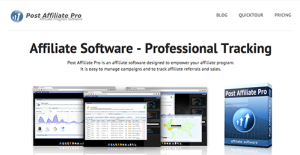 Post Affiliate Pro is a powerful solution for online stores and eCommerce websites that helps them track and monitor their affiliate network. Many businesses that offer online services and goods require affiliate marketers to help them drive customers to their websites and increase their sales. With Post Affiliate Pro, managing affiliate marketers becomes a tad easier especially when the network becomes huge and their numbers grow. Post Affiliate Pro also helps you monitor your commissions payout. You only pay commissions to your affiliate marketers only when a purchase has been made and completed. Each company has different needs and requires a software that can be customized for their size, kind of staff members and clients, and the specific industry they are in. For these reasons, no software can provide perfect features out-of-the-box. When you search a software system, first be sure what you require it for. Read some Post Affiliate Pro reviews and ask yourself do you want basic functionality or do you need complex features? Are there any industry-specific tools that you are looking for? Find the answers to these questions to help your search. There are plenty of factors that you need to mull over and these include your budget, specific business requirements, your company size, integration needs etc. Take your time, try out a few free trials, and finally choose the app that presents all that you want to improve your company effectiveness and productivity. Post Affiliate Pro has three product packages paid monthly and downloadable licenses available for a one-time fee. Flexible, robust and high performance solution for small to mid sized affiliate programs. We realize that when you make a decision to buy Affiliate Marketing Software it’s important not only to see how experts evaluate it in their reviews, but also to find out if the real people and companies that buy it are actually satisfied with the product. That’s why we’ve created our behavior-based Customer Satisfaction Algorithm™ that gathers customer reviews, comments and Post Affiliate Pro reviews across a wide range of social media sites. The data is then presented in an easy to digest form showing how many people had positive and negative experience with Post Affiliate Pro. With that information at hand you should be equipped to make an informed buying decision that you won’t regret. What are Post Affiliate Pro pricing details? What integrations are available for Post Affiliate Pro? Pros: There are many things I like about Post Affiliate Pro, but most of the time, it all comes to power and simplicity. Working with it won't take time, and even most complex tasks are fulfilled in a matter of hours. I guess it is because it is visually involving, and provides a huge customization capacity, which is not the case with few similar programs I've tried. The support team acts as if they have always worked hand by hand with us. They know our issues and help us immensely! Cons: The problem I have is personal-being a slow learner, I always have issues digging in small, apparently unuseful nuances that make a big difference in solving problems, but if you like experiments, Post Pro is cut for it. What could be better is more wordpress plugin support for displaying content, but that's not a crticial issue at all. trust me, the product is worth it. Pros: Everybody creating affiliate programs can appreciate the importance of perosnal management and customization, and would therefore make for the perfect PAP candidate. There are many features to work with, most of them impressive such as multiple affiliate tiers and split commissions whih allow me to to do both manual and automatic approval of new affiliates. The support team, being as good as it is, adds immense value to the product. Overall, using PAP is an amazing experience. Cons: I was concerned about the setup in the beginning, it seemed like I have to 'chew' too much information at once. Still, it turned out to be very simple, since everything was clearly explained in their knowledge base. Somehow, the program makes you feel confident that you can deal with every assignment, and that's probably one of the things I like the most about it. Post Affiliate Pro has started to be an essential part of my marketing activities. It helps me to track which partner referred how many leads and also how much were these leads worth. Based on that, I can reward my affiliates and it is all AUTOMATED! If you need more information about Post Affiliate Pro or you simply have a question let us know what you need and we’ll forward your request directly to the vendor.